ONE of the most exciting developments in traditional music is on the horizon this summer as the city prepares for its first ever Belfast Summer School of Traditional Music. The groundbreaking summer school will bring traditional music students, artists, performers and tutors from all sections of the traditional music community with a programme of music masterclasses, talks, lectures, workshops, performances and concerts lined up. The Belfast Summer School of Traditional Music (BSSoTM) will take place between July 31 and August 4. 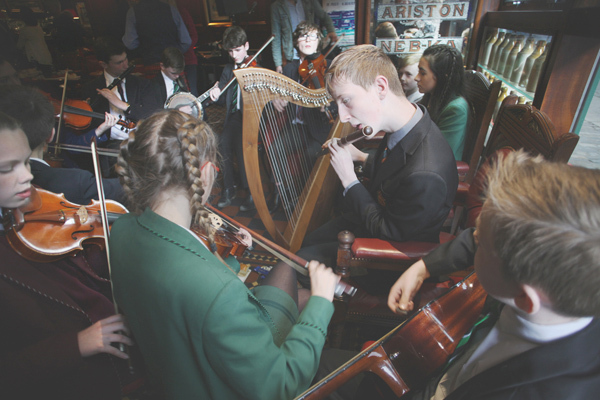 At the recent launch, which took place at the Dark Horse in Belfast’s Cathedral Quarter, Duke Special and Ulaid joined pupils from Glengormley School of Traditional Music whose performances were perfect for the occasion. For one man, Belfast’s first inaugural Summer School of Traditional Music is a dream come true. Ray Morgan, Chairperson of Glengormley School of Traditional Music and co-founder of the BSSoTM, said he was delighted to finally bring the exciting initiative to Belfast. “It has always been an idea of mine for a few years now,” he said. “So many kids from my own school in Glengormley had to travel across Ireland to attend a summer scheme and I thought it was a shame so many missed out. “Already 25 to 30 pupils from my own school have signed up for the summer scheme. It’s a fantastic opportunity for them to improve their musical talent of course as well as giving them an opportunity to expand socially to make new friends. I think it will also give them a bigger interest and commitment to traditional music. The Summer School will bring a wealth of famous names from the world of traditional music for a number of Music Masterclasses- one-on-one education with budding musicians as Belfast is transformed into the traditional musical capital of Ireland for five days. The Belfast Summer School of Traditional Music is also breaking new ground with the Ulster-Scots community. Pipers, drummers and fifers will have a chance to learn and perform without having to travel to the Republic of Ireland, Scotland or further for access to world-class tutors. “Pipe Band musicians have never been involved directly in traditional Irish music summer schools and to this end the involvement of Highland bagpipers, fife players and snare drummers in a trailblazing new initiative that will provide fun as well as meaningful interaction between cultural traditions. Fans will be able to get a taste of traditional music this Friday night (May 26) with a special fundraising concert in support of the upcoming Belfast Summer School of Traditional Music, which will be held in the Duncairn Arts Centre, featuring Alan Burke, Grainne Holland, Diane Cannon and musicians and singers from Glengormley School of Traditional Music. Belfast Summer School of Traditional Music is open to players of all levels as well as listeners, visit www.belfasttraditionalmusic.com for full details and to register for classes.